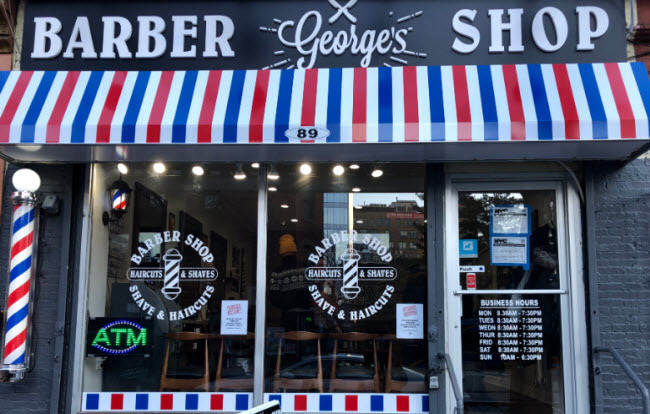 FORT GREENE/PARK SLOPE – Walking into George’s Barber Shop in Park Slope, it is hard not to be transported back in time. Between the bustle of conversation and the retro design, brothers Rafael Rubinov, 36, and Edward Rubinov, 49, along with brother-in-law Nathan Suleymanov, 26, merge an old-school determination to make it in America with an ever-changing New York neighborhood. 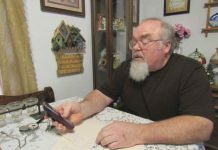 Rafael Rubinov’s family immigrated to the United States from Russia when he was five-years-old. 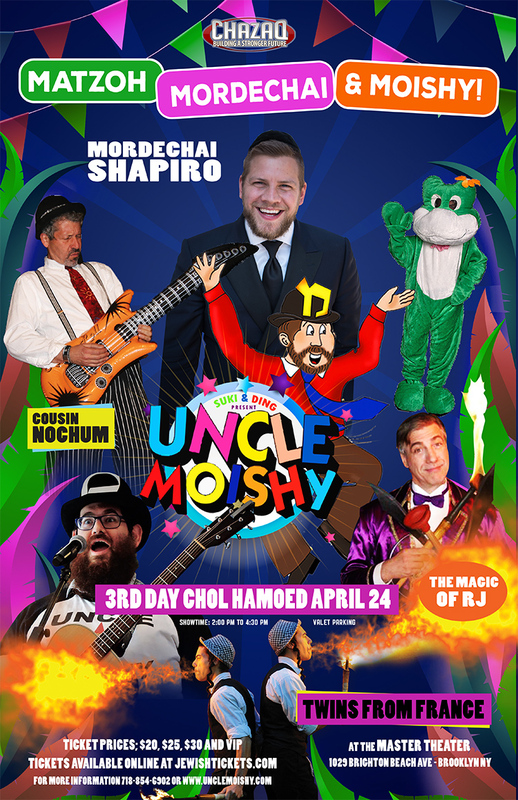 He grew up hearing stories from his parents and uncle George about the ways in which life was difficult back in Russia for Jewish families like theirs, and what they hoped to build in this country. When his uncle George made the journey to America in the summer of 1980, he came without much to his name. But, he had learned the trade of barbering in his home country and started his own shop when he arrived here. Uncle George retired about a decade ago and moved to Florida. Today Rafael (Ralph to friends, family and customers) and his brother hope to merge their uncle’s traditional work ethic and sense of loyalty with contemporary amenities and design to create a dynamic experience for customers as the franchise expands to a new Fort Greene location. About five months in the making, the new Fort Greene location opened in January 2019 and was largely inspired by customer requests. 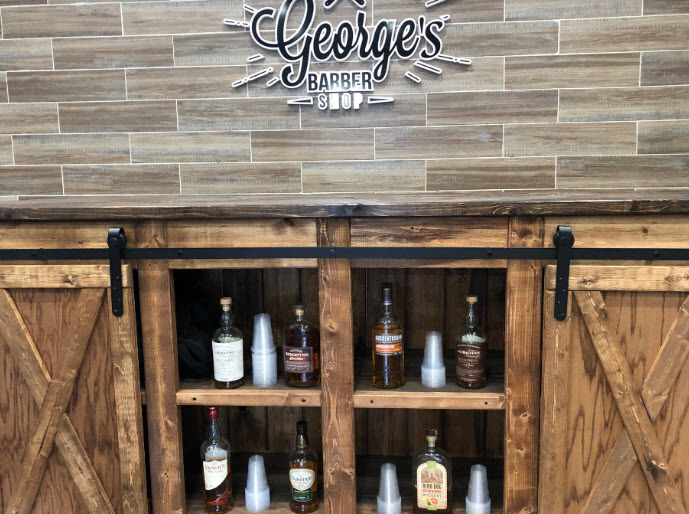 Like the other two shops, this one also features complimentary beer, whiskey and hot towel service for clients to enjoy along with their haircuts. It’s this homey vibe that keeps Julia Corbin, 31, coming back to George’s. After searching for a barbershop all over Manhattan and Queens, Corbin finally found George’s 2 (78 5th Avenue) in Park Slope five years ago. Since then, she has come by before countless important events—getting married, major job interviews and the desire for a new look—to get her hair taken care of at George’s. Multiple barbershops prior to George’s had told Corbin that the haircut she wanted was too masculine, trying to dissuade her from expressing herself in the way she wanted. At George’s, Corbin finally found a place that would accept her as she is. 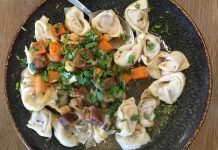 She has since recommended it to friends, out-of-town visitors and even her wife. 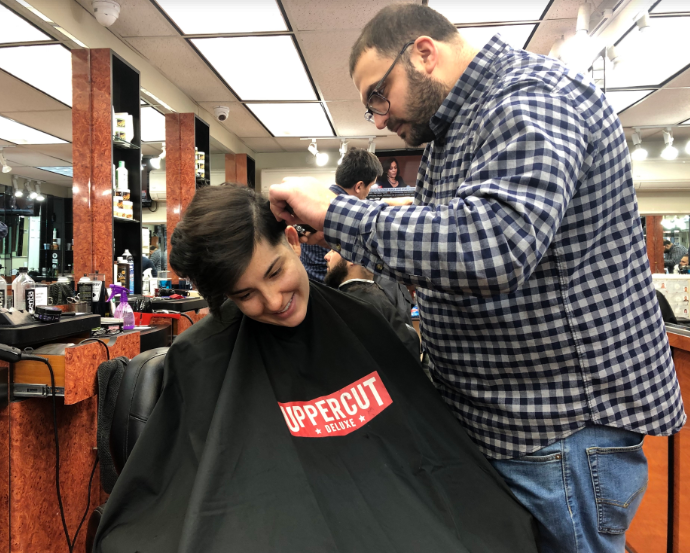 Specifically, Corbin makes the trek to hang out with Joseph Calabro, 35, a barber who has been sculpting her fade for the last few years. Calabro describes his process of getting to know his customer before diving into any cut. Multiple barbers at George’s started cutting hair from a young age. 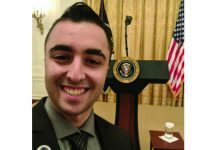 Nathan Suleymanov, partner and manager at George’s 2, was first inspired to go into the trade when he was just 16. 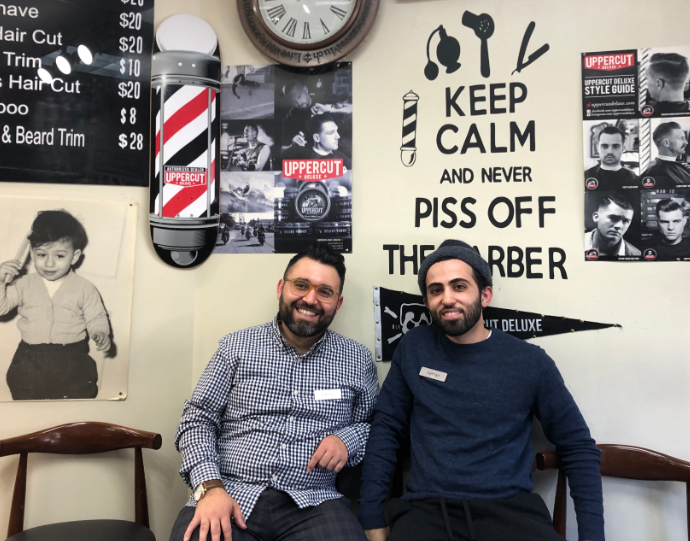 His own barber suggested he give it a try, and in addition to an inherent knack for working with hair, Suleymanov found that he enjoyed the interpersonal interactions. Suleymanov and Rubinov first met through their wives, who are sisters. 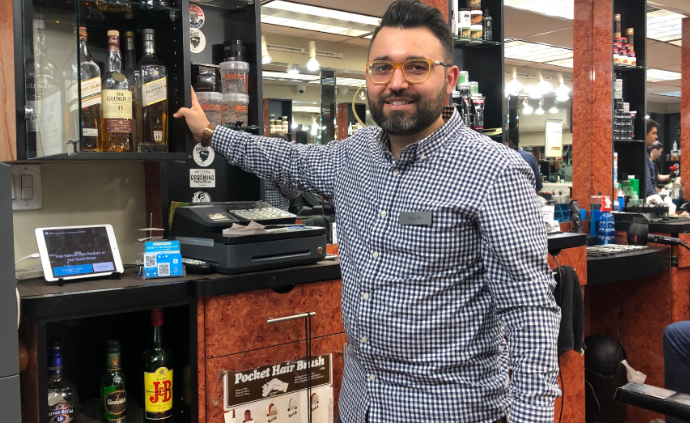 A few conversations in they realized they shared the same profession, and eventually a family relationship grew into a business bond when Suleymanov officially joined the George’s team four years ago. 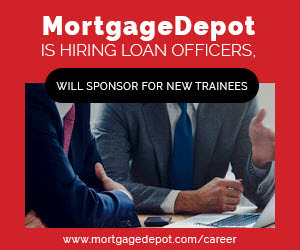 For him, creating a space where youth can be mentored and have someone to talk to is also part of the job. 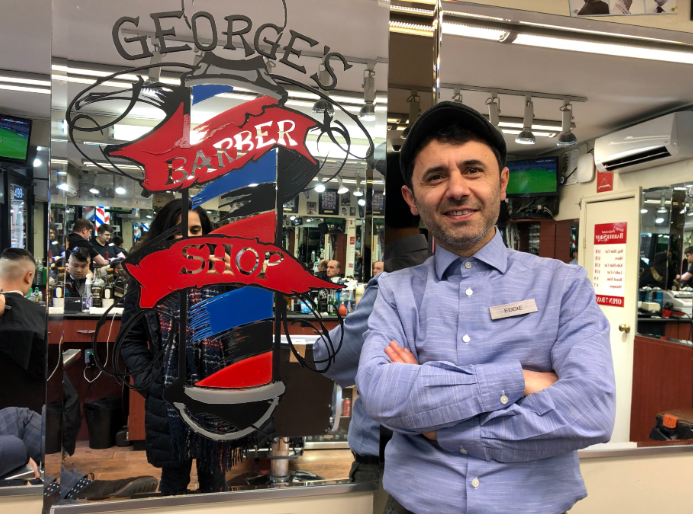 For Rubinov, it’s this chatter, conversation and sense of community that truly make a barbershop, well, “a real barbershop.” From the single chair at the first George’s that opened in 1981 to three franchised locations, one thing hasn’t changed: the customer always comes first.